Whether you're making business cards for the first time or redesigning them, you are likely to face some challenges. The standard size of a business card can vary from country to country but, the standard in the United States is 3.5 x 2 inches. If you're not formally trained in graphic design, a business card can be the hardest thing to design because of the size. The most common challenge faced when making business cards deals with the sizing and proportion. For example, you have to make the font small enough to fit all your information on the card but large enough for anyone to read. So trying to squeeze information in such a small space can be tough. Keep in mind the three points below when designing business cards. These points can help you create an effective business card. If you are unbalanced in applying any of these areas you can end up with a “Frankenstein” card. 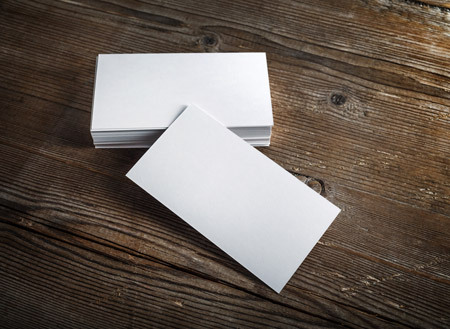 Try to avoid these common mistakes when you make your own business cards. Nowadays, it's easy to find design inspiration online. If you are creating your own business card, use resources like Pinterest to find examples of business cards that were professionally designed. Then, take note of what makes them great. Is is the use of color? Is it the type of paper used that makes the card look nice? Did they provide just enough information? What information did they provide? After analyzing what makes them great and apply those lessons learned to your design.